What could be the reason for clockwise numbering in c ring of cholesterol? It's difficult to answer why this one exactly was chosen. But see, here you have counter-clockwise numbering in first three rings, however clockwise in the last one, and with methyl and ethyl intermission. I don't think that it's an important factor anyway. In fact, fused ring systems nomenclature usually numbers the ring system peripheral atoms continuously (through the peripheral carbons, if including the fusion carbons), and in the clockwise sense, when the skeleton is in preferred orientation. However, for natural compounds, especially terpenes, there is large variety of different parent structures with various numberings. The following proposed rules for steroid nomenclature are based on agreements reached at a Conference held at the CIBA Foundation, London, on May 30th to June 1st, 1950. It is hoped to submit them for approval to the International Union of Pure and Applied Chemistry. Rule 1.—Steroids shall be numbered as in formula (I). If one or more of the carbon atoms shown in (I) is not present, the numbering of the remainder shall remain undisturbed. Remarks. 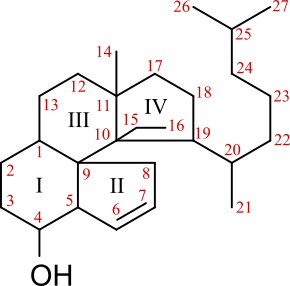 The numbering in (I) is that generally accepted in steroid chemistry, although it does not conform to that given in the “Ring Index” for cyclopenta[a]phenanthrene (No. 2561). 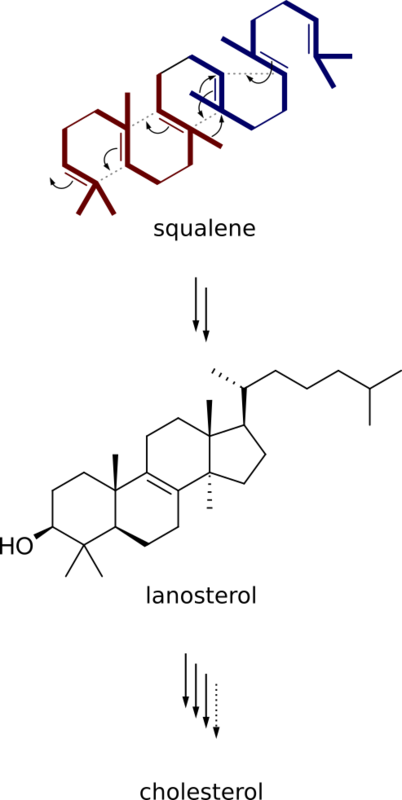 It has been the general, but not invariable, practice to assign the number 18 to the carbon atom of the methyl group attached to C(13), as in (I), because this methyl group is present in all natural steroids whereas the methyl group (involving C(19)) attached to C(10) is absent in members of the œstrogen series. …and it's used still (that's for the ring numbering. There are some changes – C-28 and C-29, not present in cholesterol, now have numbers 241 and 242). … Based on squalene (farnesyl, or farnesene units joined tail to tail depicted in different colors, their isoprene units bold) cyclization (with a couple of methyl shifts, and also hydride shifts (not depicted)) after squalene epoxidation (bottom leftmost double bond) to lanosterol (30 carbons), which then losts three methyls via oxidation and decarboxylation, and double bond is shifted. (The correct topology of of squalene cyclization was first correctly proposed by R.B. Woodward, if I'm not mistaken, as an alternative to R. Robinson proposal). Steroid nomenclature. Chem. Ind. June 23, 1951, SN 1-11. Woodward, R. B.; Bloch, K. THE CYCLIZATION OF SQUALENE IN CHOLESTEROL SYNTHESIS. J. Am. Chem. Soc. 1953, 75 (8), 2023–2024. Not the answer you're looking for? Browse other questions tagged organic-chemistry nomenclature steroids or ask your own question. What is the origin of the naming of deoxycorticosterone acetate? How is “dietary cholesterol” processed in a human body? Why is the IUPAC name of 1H-benzo[d]naphthalene not 1H-benzo[i]naphthalene?